As I watched more of these videos, I realized that my lack of any marketable skill – except that I spoke Chinese and English – could actually pay off. It was time for me to create my own video. So , I returned to my social media guru, Lara Sun. 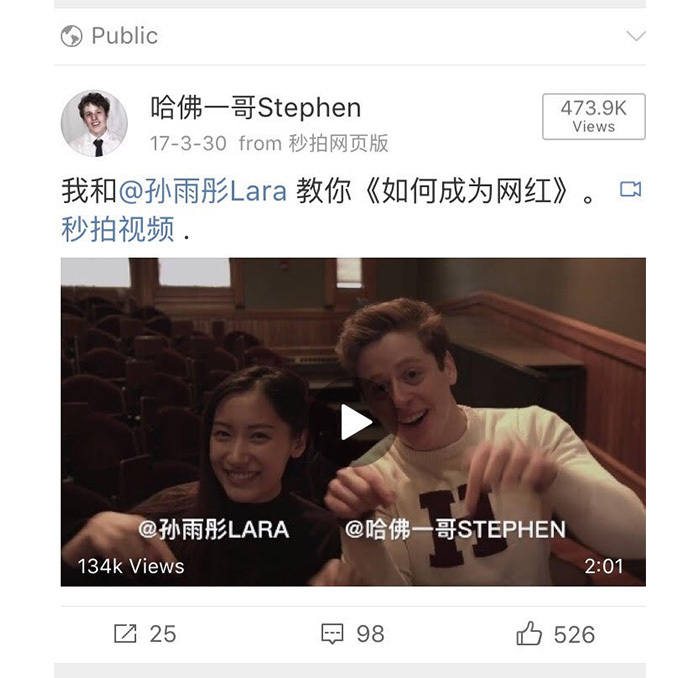 Since we'd last spoken, Lara had written an essay, gone out to hotpot with her roommate, and posted a video of her smiling which had been viewed by 2 million people. She was a mastermind. For this video to succeed, I knew I needed her guidance. But, could I convince her to help out? Surely, she must be overwhelmed with her hundreds of thousands of fans. Plus, would she ever want to be in a video with a social-media nobody like myself? Against all hope, I sent her a WeChat message. Me: Hey, Lara would you like to film a video with me? Lara (8 seconds later): Yeah, sure. I'm free any day this week. Me (hyperventilating in my dorm room): Really? Oh, uh yeah. Cool. I'm actually really busy right now. Perfect. I didn't fall for the trap of appearing too interested. After a few more texts in which I told her ＂I'm not really sure if you're the right person for this,＂ her replying ＂I really don't care,＂ and me replying ＂Okay fine. Just PLEASE film this video with me!＂, she consented, and we met up to film my first online video. I've always been told to ＂write about what I know.＂ So, initially I expected we would make a video about a lonely white-guy trying to appease his fragile self-esteem by creating an unrealistic internet version of his life in another hemisphere. However, Lara thought of an exciting reframing – what if we filmed a video called ＂How to become an internet celebrity＂? We brainstormed for a few minutes and then finally came up with a basic outline. I was to be an unwitting man interested in the glory of internet stardom. She was to be my Shifu, a master guiding me through the steps. The result was artistic genius. One critic described it as ＂The Karate Kid＂ meets ＂Glamour Girl＂ meets ＂Farewell My Concubine.＂ That critic may or may not have been me. After a few hours of filming and editing, the video was ready. I posted it on Weibo and waited. The reaction was positive (okay, anything with Lara Sun is received positively) and little by little my followership grew - from 700 into the thousands. People often bash social media, saying that it develops fake or superficial relationships. And though I think that can be true in some situations, I've been pleasantly surprised by the people I've met through this social media quest. The most important group was the people I'd collaborated with throughout the year. People I'd co-hosted live broadcasts with like Lara, Alice Yang, and Emily Song became some of my closest friends in college. They are people that I've traveled to visit, have asked for relationship advice, and have even filmed a rap video with. The second group is the people who I've become friends with purely virtually. Since starting in early 2017, I've received about a message a day from strangers interested in saying hi. For the most part, these were young students mainly in junior high or high school who were asking about study tricks. How can I learn English faster? How did you decide what to study? And (of course), do you know how I can reach Lara Sun? Fan: Hey Stephen! How are you? Me: I'm good! How are you? Some of them, however, do lead into friendships. Recently, a Chinese instructor in Kentucky reached out to me. She has a significant following herself on Weibo and so we began to chat about Chinese learning and social media. We spoke for a few weeks online and promised that if she was ever in Boston or I was in Kentucky that we would meet up. These interactions are small, but they add up, potentially creating real friendships. However, the most interesting phenomena isn't the one-off fan or the conversations that last for a few weeks. Instead, it is an entirely different beast: the super fan. It was a normal Tuesday night a few weeks after my video with Lara. I had just finished a project for school and had decided to treat myself with a torso-sized peanut butter and jelly sandwich. Then my phone beeped. To be fair, it could have been worse. This fan could have photoshopped me with a Trump hat or a much less adorable sun floating above my head. These ＂super fans＂ became most apparent when I would do live broadcasts. During my first live broadcast, no one knew who I was (and vice-versa.) But, over time, people would reference things my co-hosts and I had said in previous shows. Over a year later, there are still some people who message me to ask for when we'll live broadcast next. There is, of course, a fine line between being a ＂super fan＂ and stalking someone. But, I was pleasantly surprised by all of the fans that I had. By and large, they were simply curious junior high/high school students who wanted to learn about life outside of China. They sent silly memes, gave me pointers on my Chinese, and asked for advice about how to approach school. In fact, I assumed all of China was this friendly to foreigners. That was until…my live broadcasting account got blocked. *To be fair, one meme is probably more than I knew what to do with. I don't think there is any situation where it is cool to send someone a meme of yourself. **Unless of course you are the Grumpy Cat, in which case I'd send memes of myself all the time. A few weeks after the meme incident, I wanted to do another live broadcast. So, I called my friend Emily and asked if she'd be willing to do a live show with me. She was in the midst of trying to become China's newest Oprah, so we agreed. We met up that day around Harvard Yard, brimming with excitement. I reached for my phone, clicked open the live broadcast screen, and began to hit live. The second clock began to click up 1… 2… 3… and then suddenly it stopped. A pop-up appeared in the middle of the screen like this. I didn't quite understand what happened. Perhaps, I wasn't connected to Wi-Fi? Did I not have enough data on my plan? Perhaps my phone’s update had disabled live videos? Luckily, Emily was there so, we simply used her phone and Weibo account to film the live broadcast. I began to ask people directly. Why was my account blocked? Soon, the answer became clear. It was because I was a foreigner. 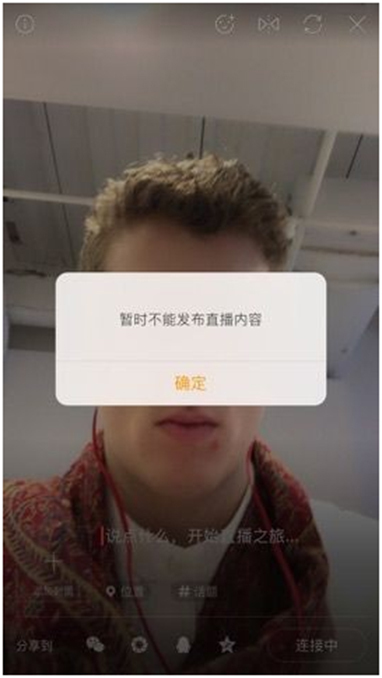 Tencent, the company that owned Weibo, was attempting to get rid of all foreigners from the live-streaming part of the platform. As I alluded to earlier, in February, 2017 the Chinese government passed new regulations that banned foreigners from using live streaming platforms. My account had passed unnoticed for the first few months. But, once it reached a critical following, it was noticed by Tencent and shut down. I could still send photos, videos, and texts. But, my ability to connect directly fans via live videos was gone. I was furious. I felt excluded for doing nothing except for being foreign. Why did it matter that I wasn't Chinese? I thought maybe I could just be a Chinese person who looks really, really white. I like to think that there is a Chinese official – let's call him Todd - whose sole job is to try to stop me from live broadcasting. Todd is desperately trying to crush my social media dreams and I am desperately trying to prevent the government from blocking my account. It was an incredible effort the two of us were exerting to keep and/or block an account whose most controversial post involved the belief that one should ＂take breaks＂ while studying. And yet, we persisted. After a few more phone calls, one sympathetic employee finally unlocked my account. I could go back to live broadcasting! However, a few months later, my arch-nemesis Todd caught wind that I was filming live videos again. In my mind, he suction-cupped to the top floor of the Tencent Tower in Shenzhen, kicked open the window, and found a large red button that would relock my account. He then pressed that button repeatedly. Currently, my account is on the losing side of this battle. Since Todd's second blocking of my account, I have yet to figure out a way around the system. The only way I've live broadcasted since has been through the accounts of my Chinese friends. Over the past few months, my usage of Chinese social media has decreased gradually. At one point during the summer, I was posting every day, creating at least one video a week, and trying to live broadcast three to four times a month. Now, in contrast, I might post once a week and do a live video once every couple of months with a friend. Part of this is because of my frustration with the Chinese government and the blocks on my account, but a bigger reason is a book I recently read about popularity. It made me question: am I seeking internet celebrity for the right reasons? During the height of my social media frenzy this summer, I listened to a podcast where Professor Mitch Prinstein spoke about his new book ＂Popular: The Power of Likability in a Status-Obsessed World.＂* The podcast seemed interesting and so I purchased an e-book and began reading. Little did I know that it would fundamentally alter my Chinese social media quest. The book has one central thesis. We all want to be popular. However, the idea of ＂popularity＂ should actually be divided into two: status and likability. Let's talk about status first. Imagine the ＂cool kids＂ in your high school. You know, the ones whose names everyone knew. The ones that looked 24 at age 15. The ones that knew what ＂an alcohol＂ was. You know who I'm talking about. These kids would be called high status. They were well-known, but perhaps not particularly well-liked. The second concept is being ＂likable.＂ If you are likable, people enjoy spending time with you, they want to be with you, and they often consider you a friend. I’m sure you can think of many kids in your high school who weren't ＂cool,＂ but we're definitely well-liked. Those kids would have high likability. In his book, Prinstein argues that our culture overemphasizes status to the neglect of likability. Unfortunately, this backfires over the course of your life. Likeable individuals are more likely to be promoted, live longer, and have meaningful friendships over the course of their life. This isn't true for status. High status individuals in high school are the most likely to engage in dangerous behavior and be aggressive towards others in adulthood. The pursuit of status, as Prinstein argues, is a counter-productive one. The outcomes that people desire - to be loved, successful and cared for, don't come from being the coolest kid, they come from being the kindest. After I read the book, I started to think about why I'd begun on this social media quest. What was it that I wanted? Was it fame? Glory? The desire to have a meme collection comparable to Grumpy Cat? I realized that my goals were almost entirely around status - I wanted people to think that I lived an interesting life and that I was someone to admire. On the other hand, becoming social media famous in China had almost nothing to do with being a nicer or better version of myself. *It is entirely possible that Todd wrote ＂Popular＂ under the pseudonym Professor Prinstein in an attempt to demotivate my Chinese social media usage. Well, it worked Todd! ARE YOU HAPPY NOW?? YOU WON! 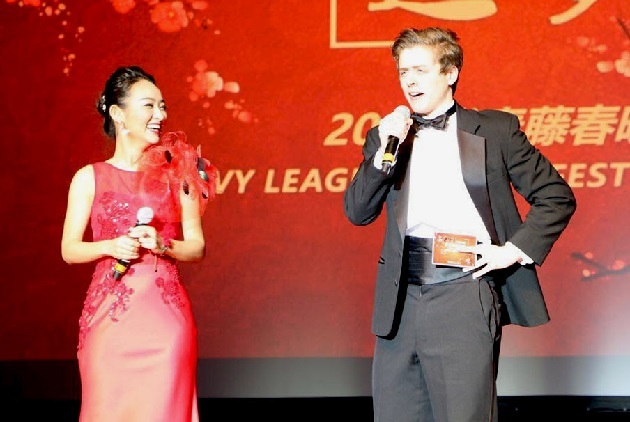 Did I Become Social Media Celebrity in China? Not Really. So, halfway through the summer, I decided I needed to slow down on my social media quest. It was hard - I'd made it a goal to reach a certain number of fans before the end of the summer, so it was hard to abandon it partway. However, by the end of the reading Prinstein's book, I knew I needed to reframe how I used social media in China and in the U.S. Almost six months after that decision, I still use Chinese social media occasionally. I still have a few friends I had made that I keep in contact with, and I will still occasionally post a few pictures of myself back at home. However, my framing is different. Almost a year after declaring I wanted to become a Chinese celebrity, I've tried to keep the parts I like - practicing Chinese, meeting real people, learning about pop culture in China - and get rid of the parts that I don't - obsessing about number of fans, likes, and comments. So, did I become a Chinese internet celebrity? Probably not. But, I did learn a lot about China, myself, and the wild world of social media fame. So, I consider it a success. Let me end with a social media call to action. You can follow me on Weibo or my Taiwan-facing Facebook page. However, what I'd appreciate more is a message or a comment saying what you thought was interesting, what you learned, and what you disagree with. It is the real connection with others that has kept me on any social media. This is with one exception - Todd. Todd, if you are reading this, send me a message with your office address. I will find you and challenge you to an epic sword-wielding duel that we can broadcast live to a Chinese audience. Unfortunately, we'll have to use your Weibo account. Mine is still blocked.